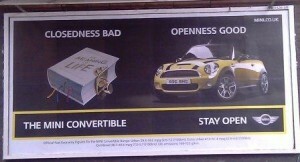 I guess having just launched a company called 100%Open makes us hypersensitive to all things open but we were captivated by this poster for the mini convertible. Their market research must have told them that there is a new zeitgeist and a spirit of openness is abroad. We are seeing this in big business certainly and the genuine three horse race that is the UK election is opening up politics. Any other good examples out there of how this is playing out in different places and spaces?